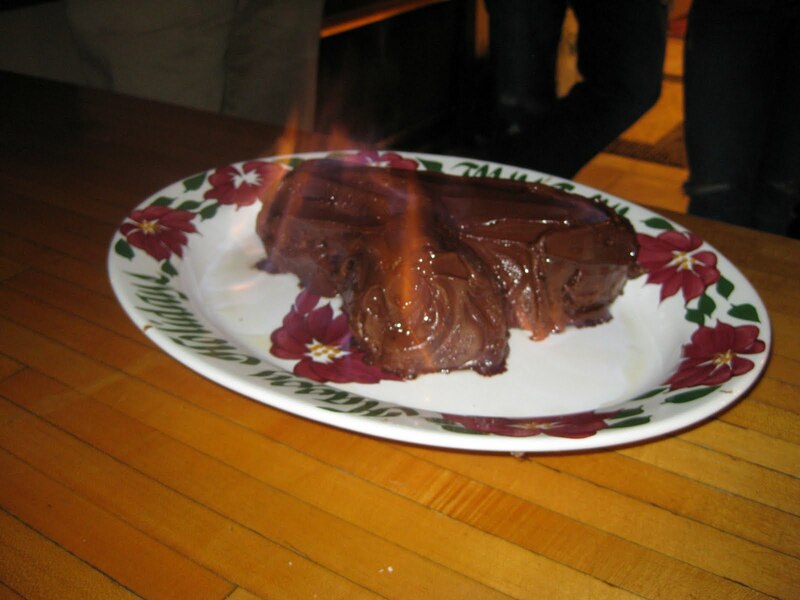 I am not sure when or how this tradition started, but ever since I was a teenager, Christmas Eve celebration has meant one special dessert: Yule Log. If I remember correctly, it might have originated from my learning about Christmas traditions in France during French class. Since je deteste learning a foreign language, this could have been the sole bright spot during a year of learning French from Mademoiselle Pinto. This rich tasting lemon and chocolate dessert graces our celebratory table each Christmas Eve, and also adds a touch of excitement, as we drizzle a bit of rum on top and then ignite our log! So, if you're looking for a way to add a little excitement to your Christmas Eve celebration, or a Francophile, give this dessert a try. It is not difficult; in fact the cake ingredients are quite simple. For assembly there are a few more steps than a typical cake, but the technique is not advanced. In a large bowl, beat 6 egg yolks with 1 tablespoon of the sugar and the lemon zest until pale and very creamy (about 2-3 minutes on HIGH). In a medium bowl, beat the egg whites until stiff peaks form when you gently rise up the beaters (do this when the beaters are OFF!). Fold* in the remaining 5 tablespoons of sugar. Once fully folded in to the egg whites, fold the egg whites into the egg yolks. Line a 10x15 cake pan and up the sides a bit with parchment or waxed paper. Grease the paper. Pour the batter into the pan and spread with a spatula until even. Bake 8 minutes, or until the edges are slightly brown. While the cake is baking, sprinkle a clean kitchen towel with a teaspoon or so of white sugar. When the cake comes out of the oven, turn the cake on top of the kitchen towel. Remove the parchment or waxed paper. Cover the cake with a new piece of parchment or waxed paper and roll up. Place seem side down on a cooling rack to cool fully. In a small microwave safe bowl, melt the chocolate chips by cooking on HIGH for 1 minute increments, stirring between each minute. Once the chocolate is fully melted, set aside. In a large bowl, cream the Neufchatel (or cream) cheese, butter and confectioner's sugar. Add the vanilla and the chocolate. Mix well. Carefully unroll the cake (it is a sponge cake and is very pliable, it has never broken when I do this step). 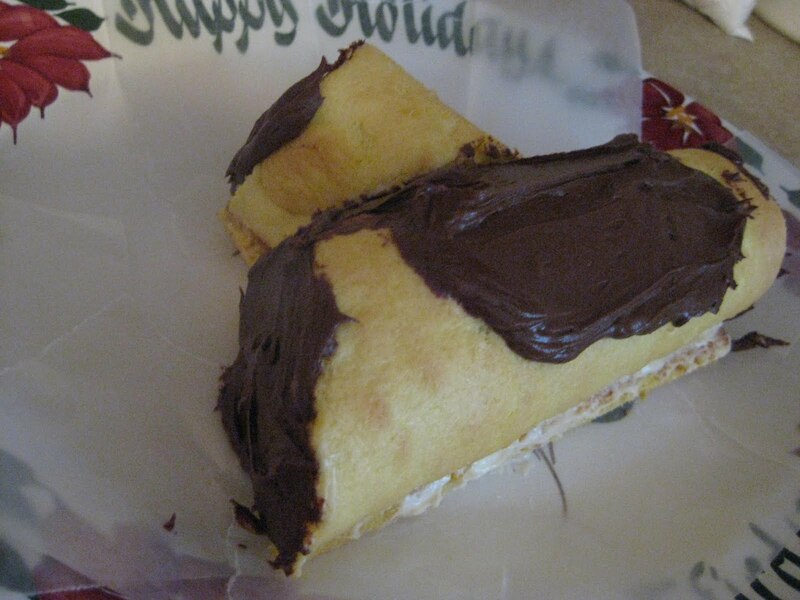 Spread a little more than 1/2 of the frosting on the cake, and then roll up. Use remaining frosting to cover the outside of the cake. Voila, you've made an amazing Christmas cake that is sure to impress! We drizzle a tablespoon or two of 151 Rum on top and then ignite our log!